Who would have thought that at this stage of life would achieve have a perennial space settlement orbiting our planet, but there it is, the International Space Station. A pileup on the size of a football field populated by six astronauts performing microgravity experiments (where there is still the ISS Earth’s gravity, so this in an orbit microgravity is called) it takes 90 minutes for a ride full Earth. 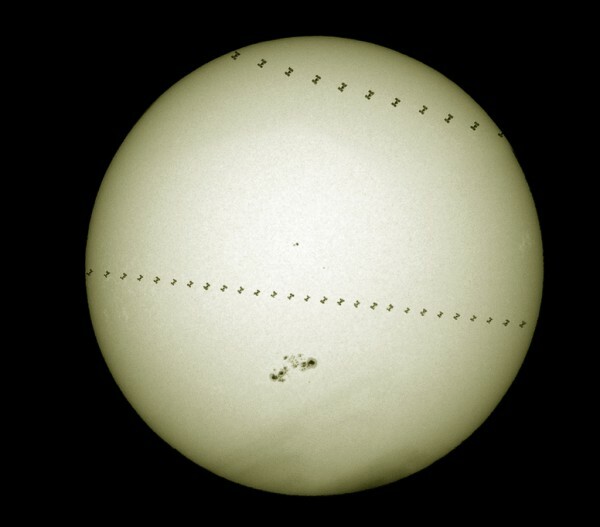 In the picture a couple of consecutive passes bottom of our sun. An image that should make us think what does the human being and what we could achieve if we want.